Five Texas schools will participate in an experimental study to record on video everything that children eat in the cafeteria. 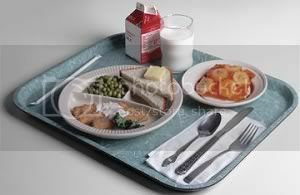 Each student is assigned a food tray with a bar code, a picture is snapped of the tray after the food is purchased and then again when the tray is returned to the kitchen, and from that calories and nutrients consumed are calculated. Parental consent is required and parents receive a report of what their child has consumed. I’m reminded of the best way to boil a live frog: rather than throwing it into boiling water where it would just jump right out, set the frog in tepid water and gradually warm it up. The frog will not notice when the danger point is reached, and will peacefully succumb to the heat. I really don’t know why anyone would want to boil a live frog, but I can think of a lot of reasons, none of them portending any good to the citizens of the United States, why the government would like to accustom our children to increasing invasion of privacy and loss of individual dignity. And that’s why I am homeschooling the revolution at my house. You know, some people who read this are going to miss your point entirely, but I didn’t and I appreciate it greatly. The frog analogy is perfect. I think the reason the government at all levels wants to put us frogs in hot water is, quite simply, to control every aspect of our lives, emphasis on the “every.” I actually got chills down my spine when I read about the school lunch monitoring. Big brother is watching, indeed! Thanks Susan. It gives me chills too, and NOT the fun kind!